By definition “No” as an adverb means not at all or to no extent. “No” excuses us from many things… often times from things we do not want to do. “No” is often a word that we do not wish to hear… “no” can be a rejection… it can be a final… it can be steadfast. “No” is a word I heard many times from my grandfather. “No” was often the word that protected me from myself. “No” was a way he protected me because he loved me. “No” is repeatedly used by the humble. “No, I am no hero” is what Bob Feller said when he came home from the war in 1945 after serving his country in the Pacific. He, as well as thousands of other men and women, had a respect for their country and its people because their lives revolved around humility. Respect cannot reside in a person who does not first welcome humility in their heart. “No sir, I am no hero… heroes didn’t come back” Bob said. “No” is the steadfast answer of a soldier who will not accept the status quo or in the face of the unacceptable. A soldier who will not accept defeat… a soldier who will not falter… even in the midst of an opportunity to rest, taking that time to repair a tattered American flag. “No, this flag will only fly in a true representation of its people… torn, yet repaired… scarred, but not defeated. Saint Augustine once said, “Do you wish to rise? Begin by descending. You plan a tower that will pierce the clouds? Lay first the foundation of humility.” The “No” of our greatest generation has allowed America to thrive… to build… to discover… to protect and to prosper. All because of the word “No”. To this day I still remember the word “no” in my grandfather’s voice, “No son, I am no hero… I did what I was asked to do and I did what I was supposed to do… never forget that,” he said. I would be willing to bet that every person reading this can immediately be reminded of someone in their lives who has used the word “no”. When you do, share that story with someone younger than you. 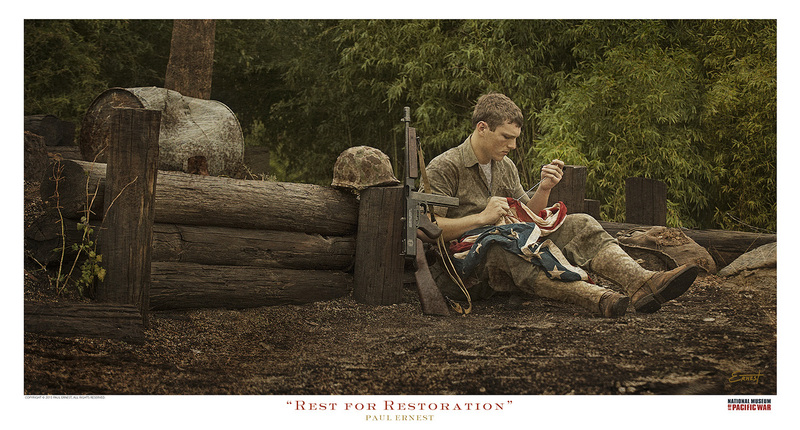 “Rest for Restoration” is on exhibit and for purchase starting later this year at the National Museum of the Pacific War along with 5 other images images in a series of 12 that will be release throughout 2015 and 2016. ← May I Tell You a Story About… Beauty?